I’ve said it before and I’ll say it again: every library school in the country should require its students to take at least one marketing course. We are all trying to convince our communities of our utility. It’s even more challenging to convince colleagues to work with you when you’re new to a community. I posted earlier this year about my primary strategy in my freshman year, the Information Audit, but I think I found an even greater success at the very…last…moment. Let me share. With about 3 weeks to go before our final faculty meeting, I learned that I would be given an hour and a half to present on library resources. We were all exhausted. I half-way joked that I didn’t want to be this guy going “Databases? Databases? Anyone?” right there at the end. I knew that this had to go well if I was to start year 2 with positive momentum…the heat was on. If the to-do list beside me is any indication, the presentation was a success. A highlight, I believe, was the research quiz I gave the faculty. I printed out sheets with the questions on them. I prefaced it with something to the effect of, “These are just a few the things that we expect our students to know, but how many of these questions can YOU answer?”. I gave them 10-15 minutes to complete the quiz and then went through the questions and answers. It generated some amazing conversation. I went to a few key teacher’s Schoology sites (key in that they are doing really cool things with their students, but they didn’t use me at all this year) and grabbed some assignments to create Libguides for. I demoed them as well as my favorite databases that I’d purchased for the school this year, and explained how we can guide students to the best resources via the Libguides. I created a screen cast to demo flipping a library lesson and offered to do this at any time, for teachers to add to their Schoology page for say, advanced search features of a key database or a Web 2.0 tool, etc. I mentioned some success stories and those teachers jumped in unprompted to explain to the group how the assignment changed, how learning was enhanced, by working with me. I wanted to leave time for departments to meet individually at the end of the meeting to fill out an index card of ideas for working in or with the library, but I ran out of time. What I ended with was a line of faculty asking questions, placing Libguide requests, and setting appointments to meet before they left campus for the summer to discuss collaboration next year. I also received an invitation from the Dean of Academics to continue the conversation by presenting periodically at faculty meetings next year and to continue to showcase collaborative success stories. Not only will it draw attention to library services, it also highlights innovative teaching throughout the school, something every teacher needs. I love a good win/win situation and I love the library being tied into a morale boosting movement on campus (more on that in a future post). Starting over has not been easy. I have learned so much about myself this year. A hard truth that I am reluctant to admit is that I am impatient. I want to be there yesterday, wherever there is. In this case, building rapport with new colleagues, streamlining processes, purchasing and then marketing resources, establishing lines of communication…it’s taken a while, but the timing of it seems to be paying off. Are you already presenting at faculty meetings? If so, what has worked well for you? What are your ideas? For those of you considering purchase, check out the features. They are reasonably priced and worth every dollar you spend, in my opinion, for the platform they provide for library instruction and integration into existing curriculum. Many university libraries are using them as well, so if you’re a college prep school, exposing your upper school students to them becomes an even more valuable experience. One of my favorite attributes is the community directory, searchable by keyword, institution type, or my favorite, best of . Inspiration overload!!! In true librarian fashion, you can ask permission, then borrow parts or entire guides that make sense for your school, attributing where the information came from. Spend more time on the front end designing a consistent look/feel/flow of your guides so that your students are trained in how to read them. 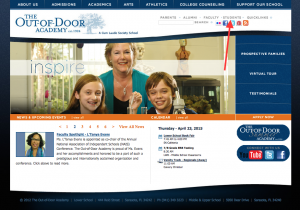 Customize your color scheme/logo to fit with your school’s site. I design my tabs to go left to right through the research process, from assignment home page to book tab, databases, web resource/evaluation, and then citation (or perhaps an avoiding plagiarism tab for good measure?). These things are not just useful for research, though! When my last school announced that they were instituting an iPad program in the middle school, I shared Berkeley Prep’s awesome iPad Initiative guide, tweaking it to fit our school/program. My colleagues were appropriately wowed (thanks CD!). 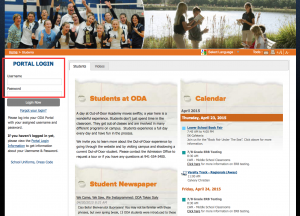 Other schools, like The Overlake School have used a Libguide as their homepage. I like this too! I will say that when I start with Libguides, I spend days setting up a good admin guide that goes unpublished. In it, I create as many boxes as possible that I think I might link to later: a Destiny catalog search box, Gale Virtual Reference Library ebook search widget, research tips, citation information and online style guides, that sort of thing. Once this is in place, you can take an assignment and just whip up a guide, linking to those boxes without having to recreate the wheel. Need to make a change? Just do it within the admin guide and the change will be reflected in every guide you’ve linked to that particular box. I have stopped creating database widgets, honestly, because it is typically a basic search and I am trying to train my girls to choose the advanced search option every time to build in Boolean, look for full text, document type, pub date, and just basically create the most sophisticated search that they can do right off the bat. So now I ask you seasoned Libguide creators: Can you share any lessons learned OR give us the link to some of your guides that you’re particularly proud of? Newbies: have any questions that others might answer in the comments below? 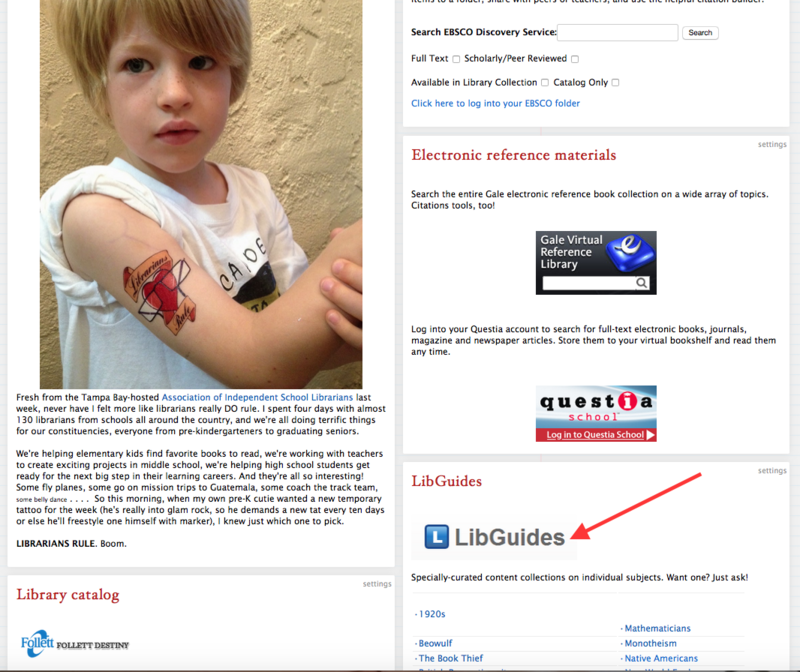 The Libguides 2.0 platform is being launched now. Here are my notes from the Hot Topics session in Dallas. Have you had any experience with the new version? What do you like/not like? Come on guys, light this comment area up! I know it’s a crazy busy time of year, but show me some LIBGUIDE LOVE! I have a favorite tool. I know I shouldn’t, but there are tools that I like more than others. I find them more helpful. They seem to be just a bit more easy to work with. And frankly, they may be more responsive. Noodletools has always been that way. And I have always loved Libguides as well. 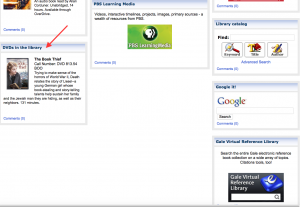 What is Libguides? Well, it is on online pathfinder, sort of an old school bibliographic pathfinder. Think of the old library with all those sheets of colored paper with columns of information on how to find things for Chemistry, Business, or even Fairy Tales. You name it and a librarian made a pathfinder, put some clip art on it and ran it off on colored paper. Well, Libguides is the new and improved bibliographic pathfinder. But it is so much more as well. At Berkeley Preparatory School in the Jean Ann Cone Library, we use it for all of our classes and some of our clubs, as well. We are completely electronic in grades 6-12, when it comes to library course material. 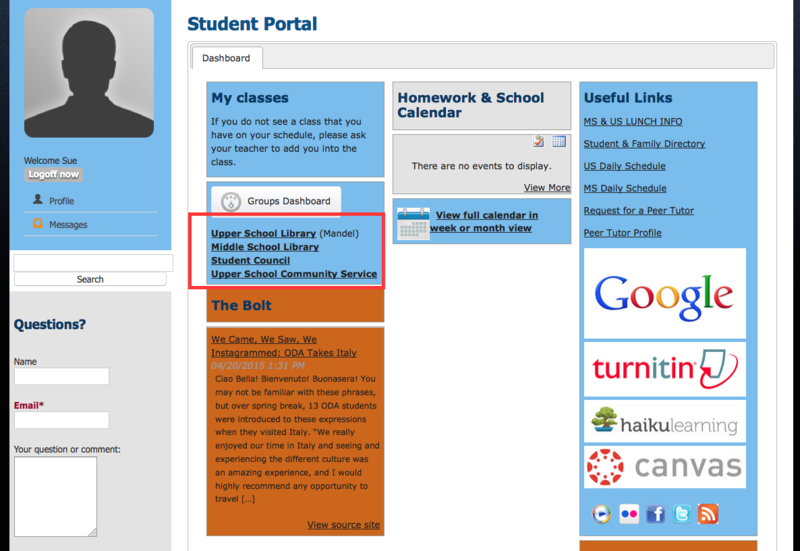 All of the information about our projects can be found on Libguides with duplicates of some teacher material on Edline. 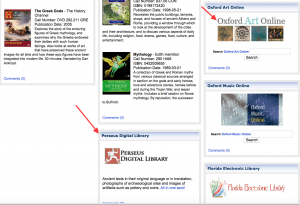 We did have a few problems when we first got started with Libguides. One was settling on a style guide to use for all of our classes so that students would get familiar with where to find information. That took a while. We also needed to have a common look and feel that blended with the school’s colors. We made sure to use the accepted school logo. We sat down as a department and decided on how we were going to lay out the pages for our classes. The way the pages are arranged is the same: Project Details (or Class Name), Databases and Websites, Books and Ebooks, Works Cited and Passwords. There may be additional pages, such as Primary Sources, etc., depending upon the class and the assignment, but that is the basic layout. It’s important to talk about what you want on the page. Are there differences in the way your kids search? Do you definitely want them to contact you? Do you always want your contact info on the right hand side of the password page? Do you want all pages to be two columns? Now is the time to have those conversations. Bring some kids in and have some conversations with them. Have them draw out what a great Libguide page looks like to them. Last year, we took an online seminar by Springshare and heard about a redesign and had another meeting where we decided to incorporate more graphics into our Libguides. We also wanted to create a template to get our links from, as recommended by the amazing librarian, David Wee. Wee suggests having one Libguide where you store all of your links to your databases and links you use frequently. Then reuse those links out to your class Libguides, don’t copy them, that way, when you change your template, those changes are populated out through all of your classes. It makes thing much easier. This fact was brought home to us in real time this year when we did a switch over to EZproxy logins. We needed to add the EZproxy address to the frontend of every database link we had. I had mistakenly copied some links into a Libguide rather than pulling them in. What a bother! And what a hassle for the kids. Never again. Make the survey open the day that you make it, otherwise you can’t see it to test it. Take the survey to test it. That way you can find grammatical and spelling errors and things that just sound wrong. Think about what questions are essential to be answered. Don’t make your survey too long. 20 questions max. They are kids! I have used questions adapted from TRAILS for a 9th grade class to evaluate their digital literacy skills. I have also used a Libguide survey to query the whole upper school during advisory (almost 300 responses) about their thoughts on a recent all-school convocation speaker and film festival we had. Our students are rarely given a voice and this was a new experience for them. Granted, there were many silly responses and some very negative ones, but there were enough thoughtful responses to make the exercise useful. Yes, steal. Well, not really. 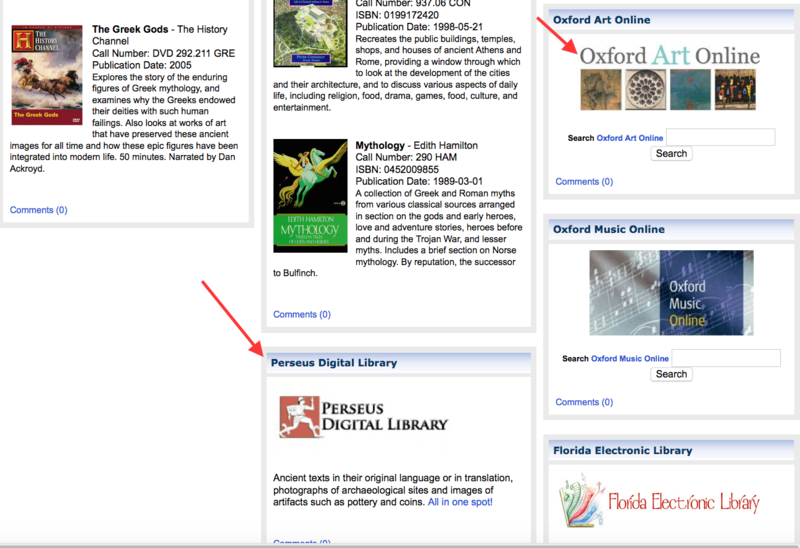 The nice thing about Libguides is that it tells you when people are using your work. I have one Libguide that a lot of people seem to really like: My Libguide on our Model UN club. It’s fairly detailed, has lots of links and gets used by the kids for research. Please feel free to use it for your Model UN club if you have one. I’m constantly updating and changing things around, so it is always in flux. When someone wants to use it, they usually send me an email asking to use it. I reply back, “Sure.” When they just take it, Libguides sends me an email saying someone is using my Libguides. Annoying, but still flattering in a way. Better to give people a head’s up. 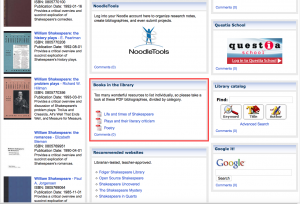 Search the entire Libguide community. There is an amazing wealth of knowledge out there. Use it! Don’t reinvent the wheel. 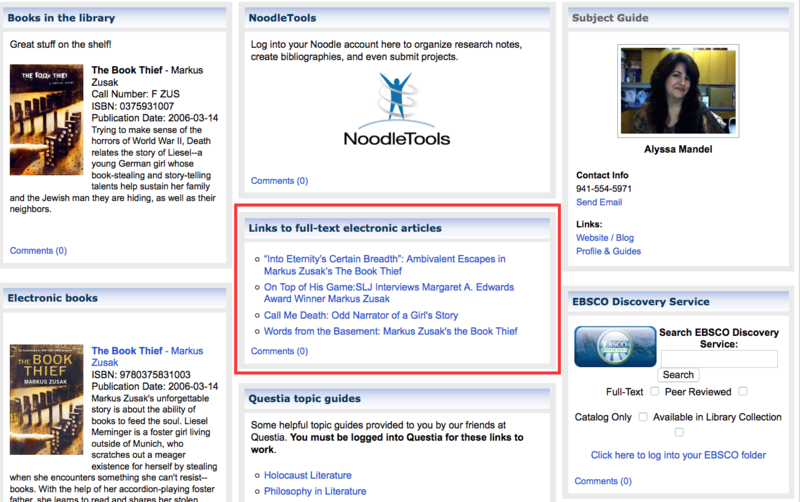 You can also link to people’s pages directly. Here is an example where I have done that: US History Primary Sources. That’s a nice option too. The first tab is mine, the red tabs are another librarians. Those pages are maintained by the librarian who created them. I also take the interior content from boxes and credit the librarian who came up with content. It was, after all, their research. It is only fair to credit their hard work. It is a nice community. Play nice. 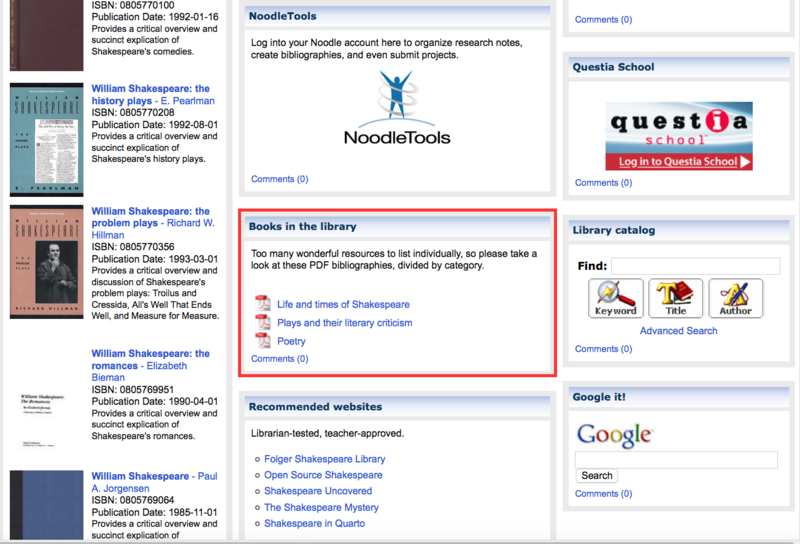 Libguides is a librarian tool, but we don’t hoard it. 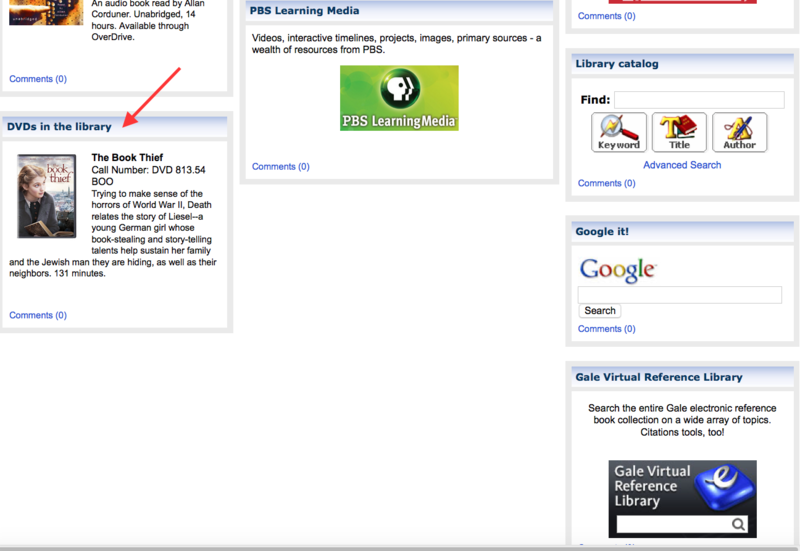 This year we actively pursued teachers and got them to create Libguide class pages. We had several sign up for sessions with us on how to create a page (Biology, Genetics, English and Music), but Biology was the only one who actually kept the Libguide going and active. Baby steps! We also had some teachers willing to step outside the box and try Libguides as a new type of assessment tool. One English teacher is using it with her 9th graders as an online magazine. Each student has editing privileges and can put up their own stories on a features page (Sports, Food, Technology, etc.). So far, the teacher has been very pleased. It is password protected or I would share it with you. Last year we used it in 11th grade English to comment on books. That was a less successful venture. 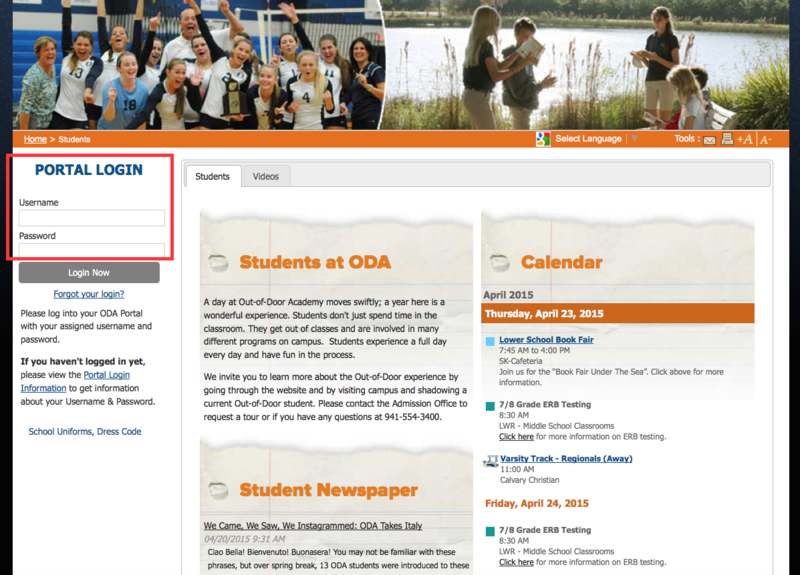 This year, Libguides has a class discussion page, which is blog-like. The biology teacher will be using that feature later this semester. We’ve had some successes. We’ve had some failures, but overall, the ease of use and functionality of Libguides is so amazing that I love this tool. I would love for you to take a look at our Libguides. We aren’t perfect by any means. Currently, we are looking at our template and testing our template to see if it needs to be tweaked. We think that the current format might make the page too long for the Middle Division students and they might be unwilling to scroll down. We prepared two nearly identical pages for World History (one with graphics and one without) to get a sense of if the graphics and layout were affecting clickthroughs. We’ll have more data in a week or two. We will have a final talk at the end of the year and make some changes as a team then. Until then, if you have some suggestions for what works, what you like or don’t like, please let us know. We would love to hear from you! Since graduating from library school, I have worked in corporate, public, and independent school libraries. Through it all, there has been a glaring common denominator: the need to market the library to my community, to convince them of its utility, to “sell” my resources and my services. It’s crazy how hard you have to work to help people these days, huh? I believe that it’s as important as anything we do because really, what good is a well designed space and a great collection of books and digital resources if no one uses them? Here are some of my marketing schemes. I know there are some rock star librarians reading this so please, use the comments feature to build upon these ideas. Idea 1: the digital newsletter. This has been key for me in putting it all together, for promoting databases, library programs, new books, faculty book clubs, and really just anything cool and relevant that I can come up with. Get their attention with a well-designed newsletter and you will keep their attention when it comes time to collaborate, to schedule research conferences with students, whatever you like. I really got into it at GPS–here’s the my archive. I moved to Emma Willard in August and recently did my first one here, eReaderissue1oct2013. I love that it’s gotten people talking! I don’t think that many of my new colleagues knew what I was ‘about’ before they read it. Microsoft Publisher template, tweaked to fit your school colors, hyperlink away, mix in some fun quotes and images, call out a cool database or app people should know, give a teacher a little shout out, then publish to PDF and attach to email or link to your web site. So easy, so fun, it will work. Trust me. Idea 2: sugary bribery. Ask to attend a department meeting. If it’s before 11 a.m., offer to bring donuts. If it’s after noon, make it cookies. Tell them what you can do to make their lives easier and to better prepare their students. Tell them that you want to anticipate their needs before they even realize those needs (so you need to know what they’re doing, right?). Start a conversation about how you have already been working with members of their department (or other departments) to give them ideas of what you can offer. Talk about how you can work with them to develop Libguides to streamline the research process for their students. In short, sell it baby! Here’s your chance! Once you learn what they’re doing and where they might like some help, follow up! Do your research, find out better ways to help them achieve their goals in class. Look for articles that might be of interest to them. Help them with their summer reading list. Offer to host it on your web site or as part of a summer reading Libguide. You help them, they’ll continue to use you in even more meaningful ways. Simple as that. Idea 3: This isn’t so novel an idea, but I find it’s as effective as anything: be their friend. Sit in the lunchroom whenever you can. Chaperone if your schedule allows it. Just be cool. Friends want to work with friends, right? There’s nothing disingenuous about it. Be you, but just put yourself out there and talk to people. These connections will build momentum for you and your library program. Idea 4: If folks are strapped for time in your school, expand your services outside the library walls. Pack up your laptop and go to THEM to teach a research lesson. Don’t wait for them to come to you. Flip your library. If you want to show them a particular database that would be good for their research project, send them a short screencast. Demo an app. Make a quick tutorial and post it to Vimeo. They can plug these into the course management page and you can use them again for other classes. Demonstrating your comfort with technology only builds credibility. Offering to be their life preserver, to come to their class to help them introduce a new technology (and stick around for when (not if!) things don’t work quite right), this makes you even more valuable. 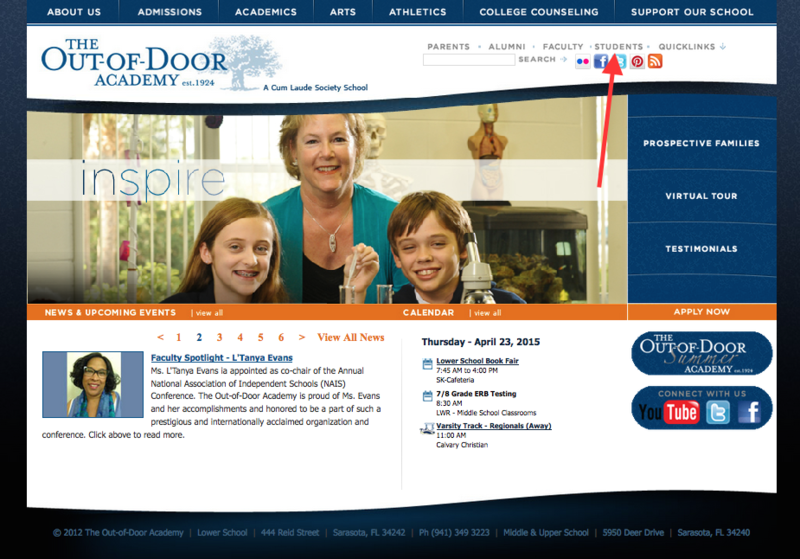 Coming in December, Part 2: Marketing Strategies for your Upper School Students. I would love to hear your thoughts, ideas, and success stories! Please use the comments to share.